The photographs have been organised according the initial letters of the caption. 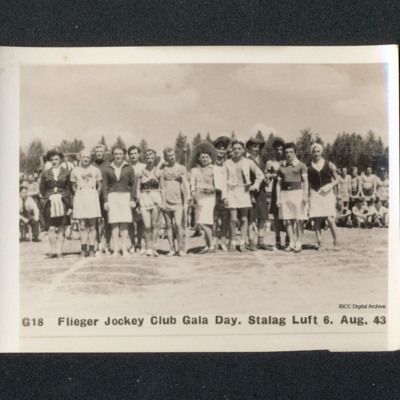 A consists of 19 photographs taken at Stalag Luft 3 prisoner of war camp in August 1942. They cover the non commissioned officers’ arts & crafts exhibition: some models are for display and others are for use; there are also paintings and jewellery. B of 54 photographs taken at Stalag Luft 1 and Dulag Luft, covering sporting, theatrical, musical and model making activities. The funeral of Sergeant J C Shaw, who was shot whilst attempting to escape is covered with several photographs. 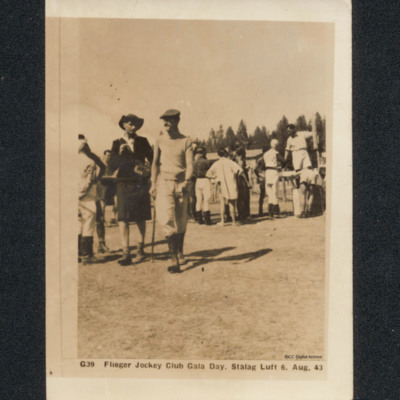 C consists of 42 photographs taken at the sports day at Stalag Luft 3 prisoner of war camp in August 1942. Activities include rugby, running, high jumping, long jumping, long distance walking, shot putting, discus throwing and basketball. Betting on the events was carried on. 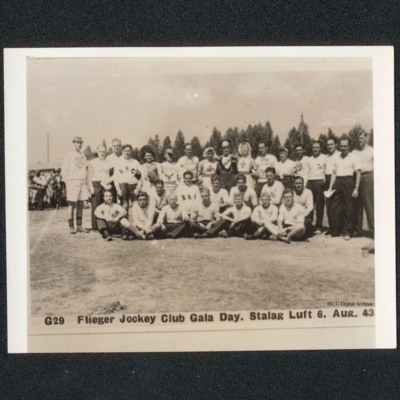 D consists of 42 photographs taken at Stalag Luft 3 prisoner of war camp in 1942 and 1943. They cover theatrical, musical and model activities. 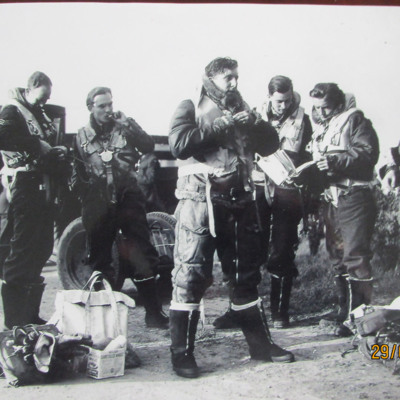 The plays were written or adapted by the airmen. Some of the models seen in section A are being sailed or steamed on the camp pond. 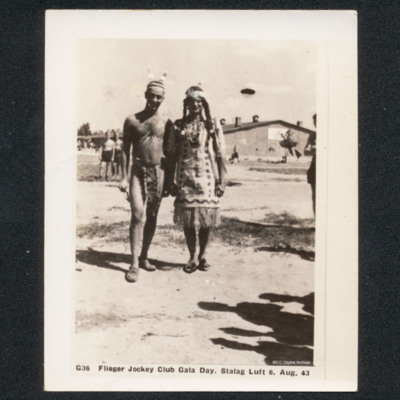 E consists of 39 photographs taken at Stalag Luft 3 prisoner of war camp in March and April 1943. They cover three plays written or adapted by the airmen. 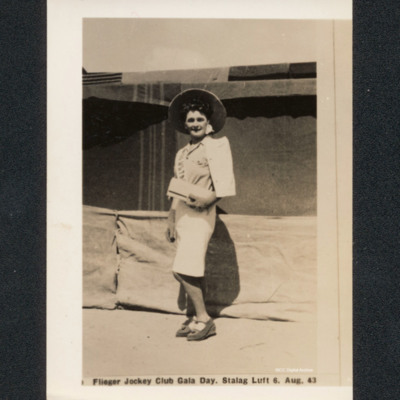 F consists of 28 photographs taken at Stalag Luft 3, Stalag Luft 1 and Dulag Luft prisoner of war camps. They cover two plays written or adapted by the airmen. Also shown are views of the camp, four recaptured escapees, a sentry in his box, the NCOs rugby team and Christmas dinner 1940. 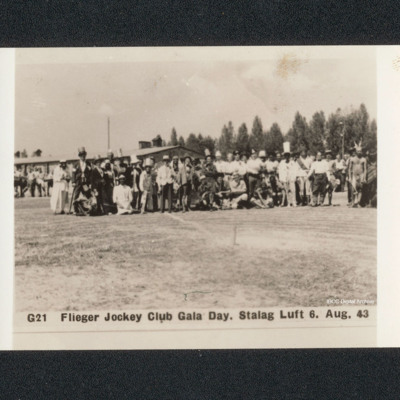 G consists of 38 photographs taken at the Flieger Jockey Club Gala Day at Stalag Luft 3 prisoner of war camp in August 1943. 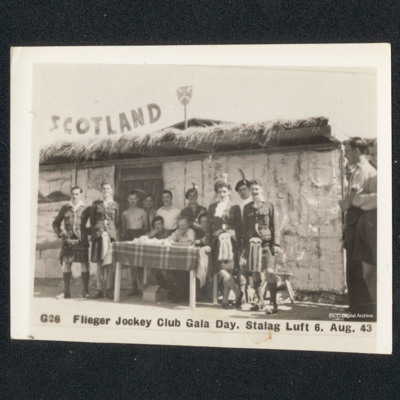 There are many varied fancy dress themes in addition to jockeys - an American cheerleader and an Uncle Sam, cowboys and Indians, a Welsh and a Scottish section, Indian (Asian) marching band, Maoris, Highland dancing, a lot of men dressed as women, bands, top hatted 'toffs'. 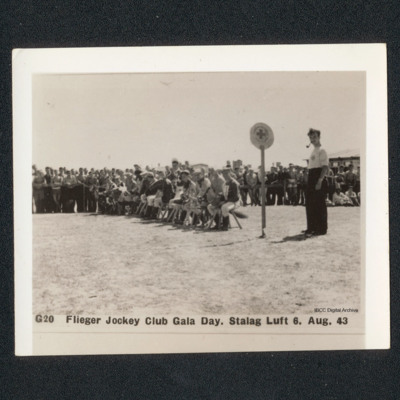 Betting activities were carried out on the results of the hobby horse type races shown. The collection has been loaned to the IBCC Digital Archive for digitisation by Ron Hemsworth and catalogued by Barry Hunter. 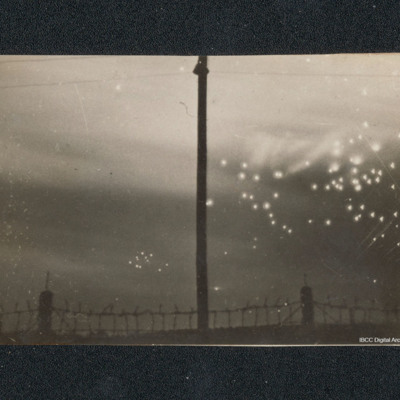 Target indicators are descending from a cloudy sky; anti-aircraft fire on the left. The silhouettes of barbed wire and an utility pole are visible. Blocks of huts and other buildings stand in the camp area. Sections of barbed wire and a guard tower are visible. In the distance, the Barth church tower. 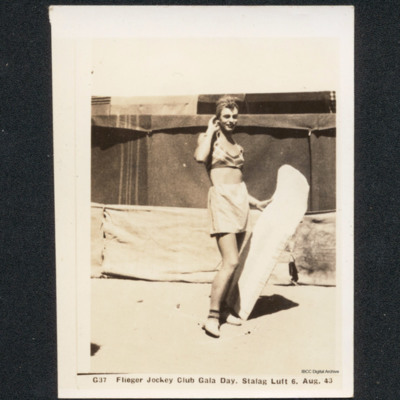 A man is dressed as a surfing woman. He is wearing shorts and a bikini top and is holding a surfing board. Two men dressed as Native Americans. One is wearing a loin cloth and tribal markings the other is dressed as a woman with long braids and a frilly hemmed dress. Behind two spectators look on and in the distance a hut. A man dressed as a horse. 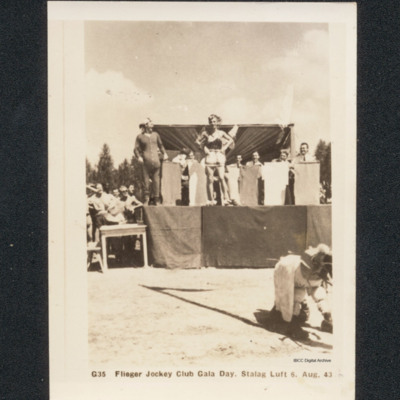 On a raised platform are a man dressed as a cheerleader and another man dressed in an old fashioned sleeping garment. Behind them is a band behind stands. 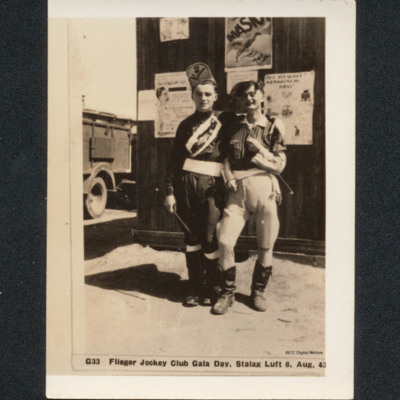 Two men dressed as jockeys, holding whips. They are standing in front of a wall with posters. At the side is a truck. 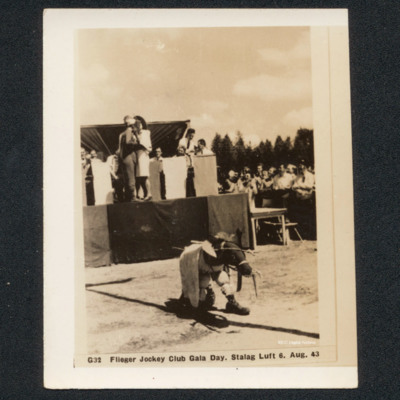 In the foreground a man dressed as a horse. On a raised platform a man and a man dressed as an elegant lady are holding each other closely. Behind them is a small band, only an accordion can be seen. At ground level there are many spectators. A man dressed as an elegant lady standing for the camera. He is wearing a large brimmed hat and is carrying a handbag. He has a sash with writing on it. 30 men arranged in three rows. One row is crossed leg, one kneeling and the third standing. Two are dressed as nurses, three have crests on their tee shirts, three have 'BBC' on their tee shirts, one man in a large hat and one man in a uniform. 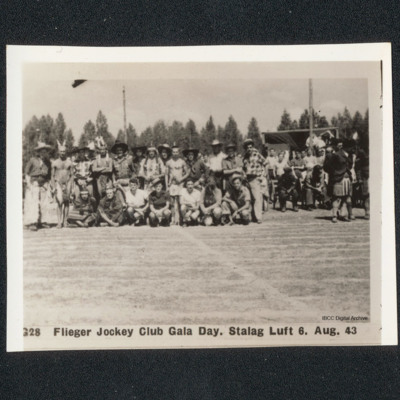 A group of men dressed as cowboys and Native Americans arranged in two rows, one standing, one kneeling or seated. Behind are many spectators and on their left a man in a kilt. 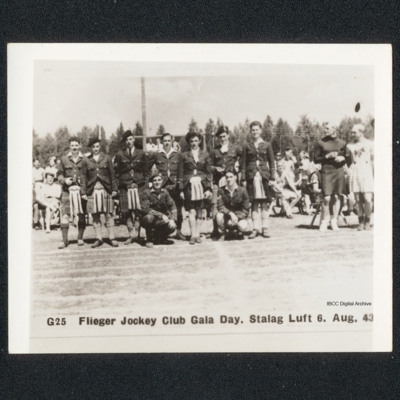 A group of eight men in kilts and uniform tops. Another man is kneeling in front of them in full uniform. At the side are two men dressed as women in short dresses. 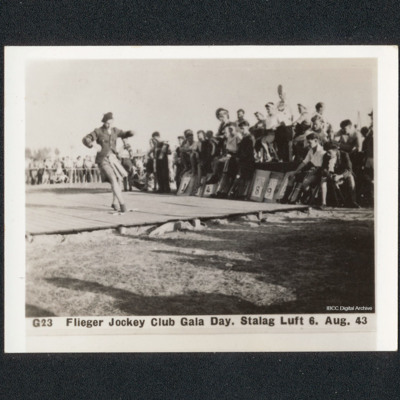 A man in kilt, uniform top and beret dances a sword dance over two crossed swords. 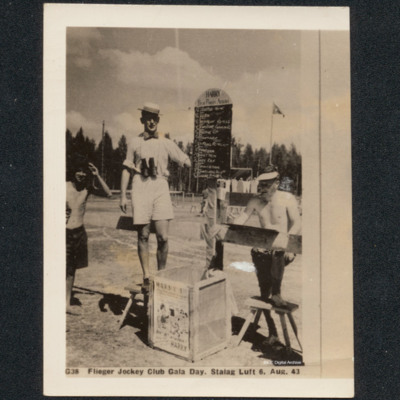 He is dancing on the wooden platform and is watched by many spectators. There is an accordionist providing music. There are numbers on boards. Five cowboys are dancing with five men dressed as cowgirls. 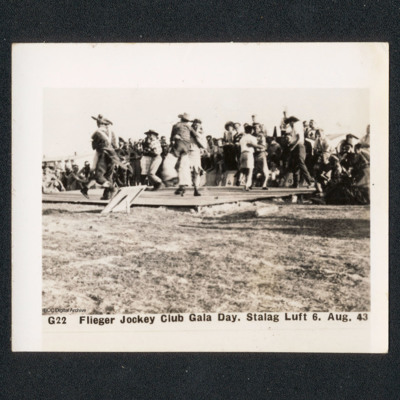 They are dancing on the wooden platform and are being watched by many spectators. A group of men wearing top hats. On their left is a man dressed as a native in a loin cloth. Behind are many spectators and a hut. 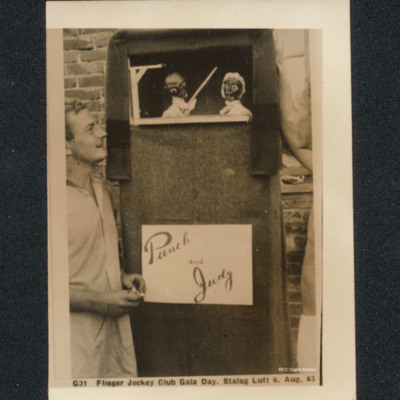 A line up of jockeys and their hobby horses ready to start. A man with a pipe stands at the finishing post/starting position. 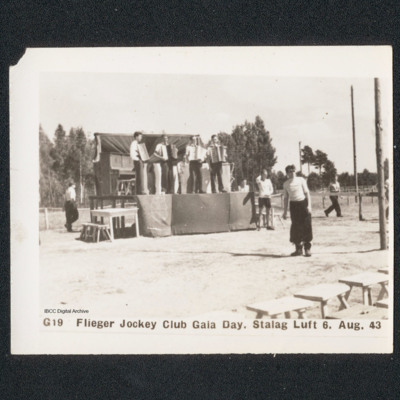 In the background there are many seated and standing spectators. Four men standing on a raised platform playing accordions. There is a man seated at a piano behind them. In the foreground are stools for spectators. There are five men standing around. A group of 14 men dressed as women. They are dressed in a variety of clothes, skirts and dresses. They are watched by many spectators.